Conti postponed salary payments to boost its cash position. FRANKFURT (Bloomberg) -- Continental AG, Europe's second-biggest car parts supplier, raised its 2010 forecasts for the second time this year, citing the auto industry's growth. The manufacturer's stock, however, fell as quarterly profit missed estimates. Full-year revenue will rise to more than 25 billion euros ($35 billion), an increase of 24 percent from 2009, and earnings before interest, taxes and one-time items will total 9 percent of sales, the Hanover-based company said Wednesday in a statement. That compares with a forecast in July of more than 15 percent growth in sales this year and an adjusted EBIT margin of 8 percent to 8.5 percent. Car-sales growth in China and other emerging markets has helped bolster earnings at Continental, which is also Europe's second-biggest tiremaker. The company has sold 3 billion euros of high-yield bonds since mid-2010 to help stretch a repayment schedule for about 8 billion euros of debt, which stems from the takeover of Siemens AG's VDO auto-parts unit in 2007. Continental dropped as much as 4.5 percent to 60.85 euros, the biggest intraday decline in a month, and was down 3.6 percent as of 9:39 CET in Frankfurt trading. That pared the stock's gain this year to 68 percent. 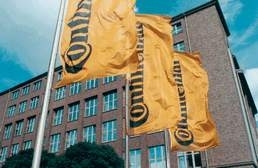 Third-quarter net income was 14.1 million euros compared with a 1.04 billion-euro loss a year earlier, Continental said. Profit was less than the average 74.8 million-euro estimate of five analysts in a Bloomberg survey. Sales rose 22 percent to 6.49 billion euros. Earnings were held back by income taxes, which totaled 128.6 million euros in the quarter versus a year-earlier credit of 72.1 million euros, and raw material costs. The company reiterated that it's appealing a German regulatory decision that raised the tax liability stemming from the controlling stake held by Schaeffler Group, the German ball-bearing manufacturer that Continental is taking steps to merge with late next year. Rubber contracts cost 58 percent more than a year earlier at the end of September at the Tokyo Commodity Exchange and have risen further since then, with futures touching a 27-month high on Oct. 26. Continental said raw-material costs will cut profit at the rubber group by more than 450 million euros for the full year, which the company will only be able to offset in part with price increases and production efficiency. The jump in rubber prices overwhelmed a sales increase at Goodyear Tire & Rubber Co., the U.S.'s biggest tiremaker, and led to a third-quarter loss. Michelin & Cie., Europe's biggest tiremaker, said on Oct. 26 that full-year expenses will surge by as much as 650 million euros because of higher raw material costs. Stuttgart-based Robert Bosch GmbH, Europe's biggest and the world's second-largest partsmaker after Denso Corp., isn't traded and doesn't release quarterly earnings figures. Continental predicted in February that group sales in 2010 would rise at least 5 percent and that operating profit would increase by a “significant” amount. “Step by step, Continental is gaining its former strength,” helped by “the tailwind of the economic recovery,” CEO Elmar Degenhart said in the statement. Net debt as of Sept. 30 narrowed to 8.1 billion euros from 9.5 billion euros a year earlier. Fourth-quarter free cash flow of about 500 million euros may allow the company to reduce the net debt figure to “well below” 8 billion euros, it said. The company needs to refinance about 7.5 billion euros of bank loans coming due in August 2012. Continental AG ranks No. 4 on the Automotive News Europe list of the top 100 global suppliers, with sales to automakers of $18.74 billion in 2009.